My company has a internal e-Learning team building the "MODS". My boss seems to think that creating a interactive, "fun" and informative "MOD"(average 30 slides, plus many different states) should only take a day or two. 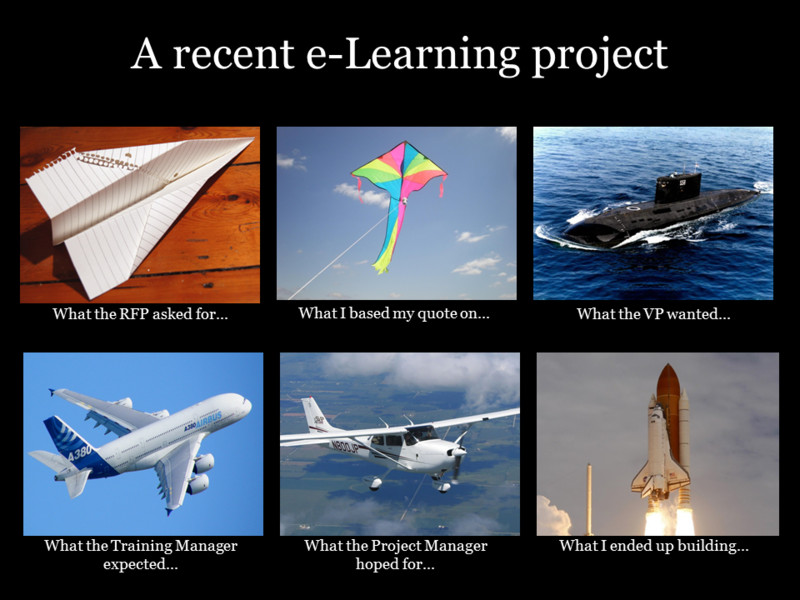 Of course my boss who is over seeing my teams operations has never used the software or even build a e-Learning, so i'm trying to reach out to others who "build" to see how long it takes them so i can explain to my boss. You'll see from the following thread, that the answer will likely be "it depends". There are so many variables in play, that each needs to be considered before you can make an accurate estimate. Those outside of the actual production have a tendency to underestimate the work required (or even those in the actual production, if you're freelancing :P), but they're also the ones who are in charge of the money (most times), so they tend to think in terms of ideals and pie in the sky. One way of dealing with this is to explain to your boss that this is a new approach, and you're unsure as to how long the development will take (honesty - yeah!). Propose that you develop this initial MOD, using his suggested approach, and then he can decide (based on development time) whether it's worth the investment to continue in such a manner. I would, (sight unseen...) expect 4-5 days each for that. I can average about 10 slides a day if I am building them from scratch but I have had times when it has taken the better part of a day for a single slide. It really depends on the level of complexity and the experience of the person developing the mods. Also, you have to factor in a longer testing period if you are creating highly interactive content and longer review times if you are creating something "new and fun" because your stakeholders will have a lot to say. I am new - like never ever touched Storyline except to toy around with the online tutorials until last week. I have 55 slides now and I have about 24 hours into just the content. Here's the kicker as far as time. I am struggling with navigation. that's where all my time is being eaten up.. I empathize with your time factors. I was singing and dancing right along as far as developing from totally blank pages. But I now have at least 20 hours into just trying to figure out how to navigate - that's the time you will need to over estimate. I've also found out that the results slide doesn't work like I thought it would, so it will take a lot more time to figure out a workaround. It's a nice feature, but it's only geared for as it implies "Results'. I thought I had overestimated the time it would take me to write this course and find that I'm spending triple what I estimated and am not nearly done yet. Like I admitted in the beginning . . . total newbie. "Hi Aaron, You'll see from the following thread, that the answer wil..."